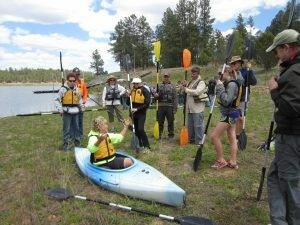 PINETOP, Ariz. — Learn how to paddle at two upcoming kayak classes in the White Mountains. On June 17, the class will be held at Fool Hollow Lake in Show Low. For those in the Round Valley area, a second class will be held at Becker Lake on Aug. 12. The course class includes instruction on the basic skills required to safely operate kayak, navigational rules, legal requirements and boating emergencies. The clinics are free and class size is limited. Participants must be at least 10 years of age. Class size is limited to 12. Register online at www.azgfd.com/education/boating/. It’s a hands-on clinic, so participants will spend time on the lake with experienced instructors. Kayaks and life jacks will be provided (although registrants can bring their own). The June 17 class at will be held at Fool Hollow Lake State Park from 9 a.m. to 2 p.m. Classroom portion will be at the Bluebird ramada. Bring a lunch and water. Fool Hollow State Park is located at 1500 N. Fool Hollow Lake, Show Low. The Becker Lake class will be held on Aug. 12 from 9 a.m. to 2 p.m. The classroom portion will be held at the Heritage Center at 418 E Main St., Springerville, Ariz. Then the class will move to Becker Lake, which is about 2.5 miles away on Hwy 191. Please bring a lunch and water. If you have questions, call the Arizona Game and Fish Department Regional office at 928-532-3680.